We're open for winter 2018/19! Book your stay online today! February 27-28 - Join us for a special storytelling evening with Chic Scott! Click to learn more. We're open for winter 2018/19! Skoki Lodge is situated in a beautiful high alpine region in Banff National Park. The eleven kilometre trail from Lake Louise to the Skoki Valley makes Skoki Lodge an ideal destination for hikers and skiers of all levels. From Skoki Lodge one can access breathtaking mountain ridges and alpine lakes, or explore five different adjoining valleys. During winter, skiers of all abilities can find ski touring and telemarking slopes as well as a variety of cross country routes around the lodge. Skoki Lodge is one of the top-16 winter adventure ‘must-dos’ on the entire continent this season, onthesnow.com has concluded. Charlie and Louise Locke, proprietors of the Lake Louise Ski Area and Skoki Lodge, were proud to host the Duke and Duchess of Cambridge this week. "Skoki Lodge Named as 'Best Place to Catch Cabin Fever' in the Winter 'Best of Skiing in Canada' issue of Ski Canada Magazine (2007)." Check out these awesome 360° Google Photo Spheres of Skoki Lodge. 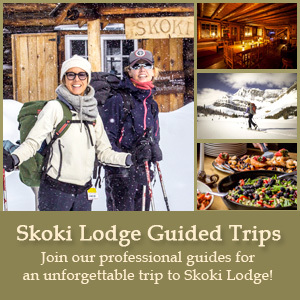 Click the button below to watch some recent videos of Skoki Lodge. "Amazing ski tour in the Canadian wilderness"
We skied into Skoki Lodge in January and absolutely loved it. The ski tour to the hut is a lot of fun. It follows a good trail starting in the Lake Louise ski resort and takes you out into the remote back country where you get spectacular views of the beautiful scenery. During the tour you really get the feeling of being in the wilderness! When we arrived at the lodge, there was already delicious cake and hot drinks waiting for us. And that was followed by even more fantastic food for dinner and breakfast. Skoki Lodge provides comfortable accommodation without the amenities of modern technology but still there is plenty of entertainment. We had a great time playing Scrabble and reading in the guide books about ski touring and mountaineering in the area. Also we met great people there and had loads of interesting conversations. So, all in all a fantastic experience and highly recommended! We would love to go back. The lodge was the first facility built specifically to cater to ski-tourists on a commercial basis in Canada, and possibly North America. It was built by a group of Banff residents who formed the Ski Club of the Canadian Rockies to manage the operation. The first guests arrived for skiing in the spring of 1931. The main building was made of local logs with saddle-notched corners. A log one-storey kitchen was added in the summer of 1931. In l935-1936, Jim Boyce made a series of additions, including the upper floor and roof dormers and what is now the living room. He also added three or four log cabins for sleeping to increase the original capacity. Like the builders of several other backcountry lodges in the area, Boyce started out as a tour guide and outfitter. In l938 he went on to build a log lodge in Lake Louise, which later became the Post Hotel. The main lodge maintains a small library with books on local history and flora and fauna. There are numerous historic photographs and ski equipment dating back to the early l930's. More information can be obtained through the Whyte Museum of the Canadian Rockies located in Banff, Alberta. Banff National Park is home to 53 species of mammals. This incredible diversity of native wildlife is a reflection of the wide range of habitats found in the park due to variations in elevation, climate, and plant communities. Bighorn sheep, black bear, hoary marmots and beaver are just a few of the species this region has to offer! For more information on species native to the region go to: www.pc.gc.ca. The trail to Skoki is prime habitat to a wide variety of alpine wildflower and rare alpine plants indigenous to the region. Throughout the area, hikers can find patches of false azalea, buffalo berries, twinberries, white rhododendrons and red elder flourish. Rocky slopes are covered by stonecrop, white flowering mountain avens, moss campion, cinquefoil, arctic willows and several species of saxifrage. Alpine meadows are mosaics of vivid colours from western anemones, alpine arnica, columbine, Indian paintbrush, spring beauty, alpine fleabane, mountain daisies and hundreds of other species of wildflowers during the midsummer bloom. When you step inside the Lodge after an exhilarating hike or ski, you to become a part of its history. For many, the retreat back to Skoki is a reminder of how wonderful and calming the simple things in life can be. Allow our friendly staff to show you to your Lodge room or Cabin and then enjoy our afternoon tea service offered in the dining room for our guests daily. Rehydrate with a glass of fresh water, lemonade or herbal tea. Share stories and photographs with your Lodge companions of your days journey with a sumptuous selection from our fine tea display. After re-energizing, many of our guests find the late afternoon the perfect time to familiarize themselves with the Lodge. Enjoy a good book from our library in front of the woodstove, or cozy up on one of the day beds and just let our mind unwind. If another hike or ski is what you desire, one of our staff would be delighted to share their ideas and knowledge of the area. Dinner at Skoki Lodge is an event unto its own. Our incredible kitchen staff are highly skilled and truly enjoy bringing only the finest culinary delights to the buffet daily. Feel free to peek into our rustic backcountry kitchen, meet the chef and staff and watch us work our magic. Skoki also offers beer and wine which is always available at the bar in the dining room daily. After dinner you may want to take a short stroll around the area, maybe unwind and retreat to the living room, perhaps a game of Scrabble or cribbage from our games cupboard, or maybe another cup of Blends coffee or herbal tea at the dining table with your new friends. In the morning let the smells of freshly brewed coffee, wood smoke, and breakfast entice you from your cozy down comforter. A two course breakfast awaits you at 8:00am and is always a feast for everyones taste-buds. After breakfast we set up a build-it-yourself gourmet lunch buffet. We always offer an array of homemade breads, delectable deli-meats, swiss and cheddar cheeses and an assortment of fresh vegetables and fruit. We also offer Skoki cookies and GORP to enjoy on your afternoon picnic on your days adventure. At this time the staff will be pleased to help you plan your days hike or ski to one of the many legendary lakes or valleys in the Skoki area. We have detailed maps and several years of personal experience in the area to help you choose the best destination for the day be it short and picturesque to strenuous and rewarding. Important Note: Skoki Lodge is home to one busy and active backcountry kitchen. While our kitchen staff strive to mitigate cross-contamination of all allergens we can not guarantee a 100% allergy free environment at all times. All meals served to all guests are prepared in the same kitchen.